You are at:Home»News»The Ultimate Fantasy Cruise? As cruise fans, we all have our favourite ports and we all have our own individual reasons for loving cruise holidays. However, a recent poll comissioned by the Passenger Shipping Association has drilled down the top places to visit on a cruise, and the top reason for choosing cruises over and above other holiday types. The top destinations would make for a really crazy cruise itinerary – we want to see Venice, New York, Barcelona, Luxor and Singapore. That’s going to be a lot of days at sea people! And as if that isn’t enough continent hopping, we also want to see the Northern Lights from our ship, so it looks like we’re going to be heading pretty far north on this journey. As well as wanting to see the Northern Lights on a cruise, a stunning 11% of people also wanted to see icebergs while they were sailing. They obviously haven’t watched Titanic recently…. When it comes to wildlife and nature, the majority of people voted that they would like to see Whales from their ship. Other popular animals included dolphins and polar bears. Although cute to watch from afar, nobody actually wanted to go on a cruise with a polar bear, instead they would like to cruise with celebrities such as Jennifer Aniston, Cameron Diaz and Johnny Depp. Let’s face it, Johnny Depp has to be a good guy to have around if anything goes wrong, we’ve seen him owning the oceans in Pirates of the Caribbean. That man knows a thing or two about sailing! 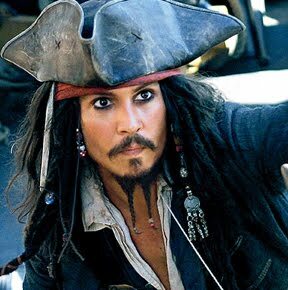 Funnily enough, Jack Sparrow topped the polls when people were asked who they would like to be captaining their ship. Someone should really tell them that Jack Sparrow isn’t real. Perhaps more worringly, second in line was Captain Cook who has been dead for over 200 years. Personally, if I received an invitation to the Captain’s table from a dead man, I think I’d have to decline, no matter how entertaining it may be to go along. And speaking of entertaintment, the most popular form of entertainment onboard a cruise ship is the classic stage show filled with feather boas and sparkly things. A staggering 47% of people voted that this is how they wanted to be entertained on their cruise. Only 7% of people voted for the somewhat more subtle form of entertainment, guest lectures. Of course many people will disagree with the above itinerary, guest selection and entertainment programme but it is fun to see the different things that people love about cruising. The one reason for cruising that came up most often was the fact that you get to see so many places in one holiday. Nothing beats that feeling you get in the morning when you wake up in a brand new country, wondering what the day ahead has in store for you.